Iris (foto's) in Het Oog bij OptiekPedia, klik hier! 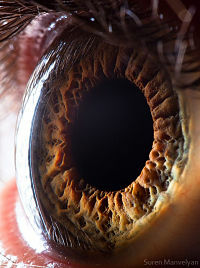 His latest popular series of close ups of a human eye – entitled “Your beautiful eyes,” together with a similar series on “Animal eyes,” have had millions of views on the Web. They were published by National Geographic, Yahoo!, Die Zeit, The Sun, Daily Mail, The Independent, Telegraph, La Republica, Liberation, Guardian, Wired, Huffington Post, Wedemain, The Shortlist, DT Magazine, MAXIM, and many others. The photos were also used by BBC Spain, BBC Brasil, WNYC, Gizmondo and many others. Suren received his PhD in Theoretical Physics from the Yerevan State University in 2001 where his research focused on Quantum Chaos. He received the President Award of the Republic of Armenia next year for his research work in the field of quantum technologies. Suren plays on five musical instruments the guitar, cello, piano, block flute, and lyre.